MOST of my life has been spent searching for the archetypal gods and goddesses of ancient foreign lands, wandering through dry and dusty mental landscapes of the early Middle East, Mesopotamia and India, looking for breadcrumb trails, while all the while, the goddess of my own green and pleasant land was just under my feet. Now I’m learning more and more about our own British goddess, who was the spiritual archetype that was loved and honoured here long before the Romans came and imposed Christian beliefs, symbols and architecture on the indigenous epigraphy, shrines, stones and wells. In reawakening her from the Dreaming Seed of the land, it appears that she has had many names, and they are all very powerful. The person who has done the most in re-remembering the ancient goddess of the British Isles is Kathy Jones, and so I’d like to post an extract from her book: The Ancient British Goddess. Kathy gains much of the inspiration for her writings by walking the goddess of the land, studying the ancient Celtic myths and journeying into her own intuition. A little of what she says may not be supported by the archaeological record. But in the Mystery teachings, we give as much credence to inspiration from Spirit as we give to a scientific means of inquiry which sternly forbids us from believing in love and compassion until it has found a formula for it. For the long ages of the palaeolithic era before 30,000BCE, the Goddess reigned alone. She was the Origin, the Virgin Void out of which She was Self-created. She was present in all forms of life. Her arching Body was the star-filled Sky. She was the Sun, the Moon and the Stars and the Space between. She was Mother Nature, Mistress of the animals and the plants. The Earth was Her Body. The rivers and oceans were Her blood and life fluids. The plants, trees and vegetation were Her hair. She was the Mother of Time. In ancient Britain the pattern of life was determined by the cycle of Her seasons. 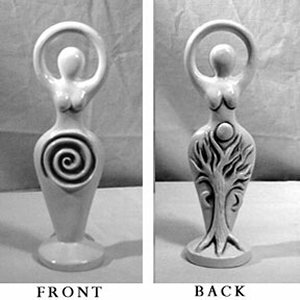 Through the turning of the year Her body was visibly transformed from the fresh green Maiden, to the vibrant Lover, to the radiant Mother and the slowly dying Crone. Through the aeons this cycle of transformation repeated itself, interrupted only by the Ice Ages in which the British Isles were completely covered in glaciers and sheets of ice. In ancient Britain the Goddess was the One who expressed Herself through the Many. She was the great Void, the Beginning of all things. She was the Source of Life, the Creatrix, Continuer and Destroyer of all that exists. She was the Matrix, the Great Mother, Spinner of the Thread of Life and Destiny, Weaver of the Web of Continuity and Cutter of the Thread at death. All souls were born from Her sacred Womb, lived for a span upon Her Body the Earth, then returned to Her Tomb/Womb at death. She was Mother of the Stars in the Heavens and of all Nature. She was the Tree of Life. 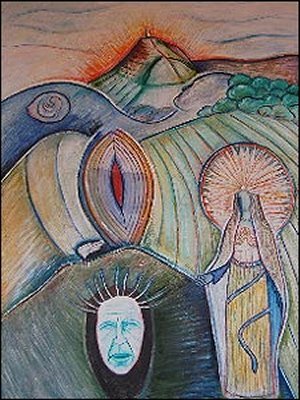 She was the Maiden, the Mother and the Crone; the Virgin, the Lover and the Whore. 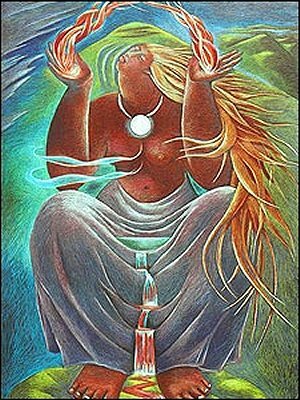 The Holy Grael of Immortality, the Chalice of Love and the Cauldron of Transformation were all in Her keeping, reflecting Her Triple nature. She was the Three, Nine and Nineteen Sisters, Ladies, Maidens, Mothers, Faerie Queens, Crones or Hags, who expressed themselves through the fourfold cycle of Her seasons. Nothing has changed, it is all still true! She lives now, today, here in our land! In Ireland She is Aibhinn, Ailech the White, Ailinn, Aine, Almu, An, Anny, Ana, Anu, Anu-Dana, Aoibheall, Artha, Badbh, Banbha, Beansidhe, Blanaidd, Bo, Boand, Breacha, Brid, Brighde, Brigit, Buanann, Cailleach Bheare, Carman, Cron, Cymeidi Cymeinfoll, Dana, Danu, Domnu, Eadon, Eblinne, Echtga, Eithne, Erin, Eriu, Etain, Fand, Fedelm, Flidas, Fodhla, Garbh Ogh, Grainne, Grian, Hag of Bheara, Kessair, Kersair, Kele, Liban, Life, Macha, Maeve, Lady Mary, Medb, Morrighan, Niamh of the Golden Hair, Queen of the Sidhe, Sadb the Deer Mother, Sheela na Gig, Sinnann, Tailtiu, Tara, Tea and the Woman with the Silver Branch. In Wales She is Arianrhod of the Silver Wheel, Blodeuwedd the Flower Maiden and Owl, Branwen, Cordelia, Creiddylad, Creidne, Creirwy, Elen, Fflur, Flower Maiden, Ganieda, Gwenddydd, triple Gwenhwyfar (triple White Phantom), Helen, Iris, Keridwen, Lady of Llyn y Fan Fach, Maumau, Meredith, Mona, Morfydd, Olwen of the White Track, Rhiannon, Sheela na Gig, White Sow and Winifride. In Scotland She is Bera, Bride, Cailleach Dubh (Dark Old Woman), Cailleach na Mointeach (of the moors), Cailleach na Montaigne (of the mountain), Cale, Car, Carline, Io, Ioua the Moon, Mag Moullach, Scathach, Scota and Scotia. In England She is Agnes, Alba, Albina, Ambrosia, Amma, Ana, Anna, Angnes, Anna Favina, Annis, Apple Woman, Argante, Ariadne, Artha, Black Annis, Black Maiden, Blue Hag, Bona Dea, Bree, Breeshey, Brigantia, Britannia, Cardea, Cat Annis, Cliton, Countess of the Fountain, Coventina, Crone, Dame Ragnell, Dana, Dark Mother, Dea Matronae, Dea Nutrix, Diana, Dindraine, Elaine, Elen of the Trackways, Enid, Eostre, Epona, Etain, Faery Queen, Flora, Fortuna, Giantess, Gliten, Glitonea, Goda, Graine, Green Lady, Green Woman, Guinevere, Hag, Harvest May, Helen, Hoeur, Igraine, Isis, Ker, Kernel, Kerhiannon, Koeur, Kundri, Lady Bertilak, Lady of Avalon, Lady of the Fountain, Lady of the Lake, Ma, Mab, Madron, Maia, Maiden of the Cart, Maid Marian, Mam, Mary, Madron, Mazoe, Modron, Morgaine, Morg-Ana, Morgen la Fey, Moronoe, the Mothers, Nimue, Nine Maidens, Nine Morgens, Nine Sisters, Nine Witches of Gloucester, Oestre, Old Wife, Old Woman, Our Lady of Glastonbury, Our Lady of Walsingham, Phaedria, Pomona, Queen of Elfame, Queen of Fate, Queen of the May, Queen of the Wasteland, Raven Queen, Regan, Rigantona (Great Queen), Sabrina, Sovereignty, Spring Queen, Sulis Minerva, Swan Maiden, Thetis, Thitis, Tree of Life, Tyronoe, Ur, Ursel, Vivienne, Verbeia, Venus, Washer at the Ford, White Doe, White Lady, Wise Woman of Wookey Hole. 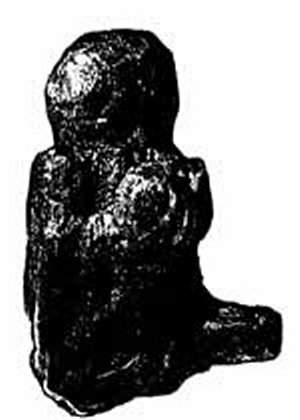 One of the earliest figurines of the Goddess in Brigit’s Isles was found preserved in the peat of the Somerset Levels. She dates from 3250 BCE and is 6″ tall and carved out of ash wood. Although claimed by archaeologists to be a hermaphrodite god doll, She has typical large breasts and a lower protrusion, which is on her left side, like a leg rather than in any central phallic position. She was found beneath the Bell Track, one of the ancient wooden trackways which once crisscrossed the watery Levels, where nomadic people fished and hunted throughout the mesolithic and neolithic eras. Perhaps she is the earliest representation of the Lady of the Lake. May you be honoured and adored forever !